For I ne'er saw true beauty till tonight. Antony and Cleopatra, Diego Rivera and Frida Kahlo, Gertrude Stein and Alice B. Toklas, Humphrey Bogart and Lauren Bacall, Joe DiMaggio and Marilyn Monroe, Elvis Presley and Priscilla Beaulieu, John Lennon and Yoko Ono-while we're familiar with all of these people as individuals, we also associate them with the grand, sometimes fiery passion they shared with their partners. "And the Rest Is History" is an intriguing look at how these iconoclastic lovers first crossed paths, whether it was through fate, setups, or blind luck. 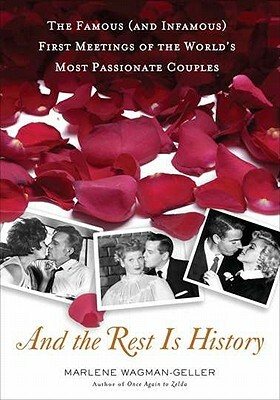 From angry sparks flying to love at first sight, the meetings shared in this book give us a look at what makes that one great love. Marlene Wagman-Geller is the author of two previous books, Once Again, to Zelda and Eureka!. She lives in San Diego.